Scrap Shotz - Christmas Planner! Hi! I hope you're having an awesome week so far. I'm over on the Scrap Shotz blog today sharing a fun planner idea using some new products in the Scrap Shotz Store - Kaisercraft First Noel Collection and the Sizzix Tim Holtz Thinlets Die Swirling Stars. Today, I'm showing you how I decorated my personal planner for December using these fun supplies. Thanks so much for stopping by! Be sure to head over to the Scrap Shotz blog to see how the rest of the planner pages are laid out and get all the details. I'd love to know if you have a planner you will be decorating for December! Scrap Shotz - Kaisercraft First Noel Layout & Video! Thanks so much for stopping by! I hope you have an awesome week :) and don't forget to stop by the Scrap Shotz Blog to see details and closeups on this layout! Scrap Shotz - Christmas Layout and Cards with New Product Reveal Video! Hello friends! I'm over on the Scrap Shotz blog today to give you a look at some beautiful new products in the Scrap Shotz store - Kaisercraft First Noel and Sizzix Tim Holtz Thinlets Die Swirling Stars. I've created a couple projects using these products, which are perfect for all your Christmas crafting! I just love the colour scheme of this collection! I'm sharing a video as well to give you a closeup of these fun goodies! Here's a look at the sweet layout of my daughter when she was 3 all dressed up in a lovely Christmas Dress! She had the most beautiful curly hair!! And, since there are so many amazing elements to this collection of goodies I had to share some cards and matching envelopes as well! Thanks so much for stopping by! Be sure to head over to the Scrap Shotz blog to see closeups and details on all the fun projects I've shown you, and have a fantastic weekend!! Kitty Bee Designs - Owl Witch Halloween Card! Hello! We are counting down to Halloween at my house, and I have a cute little card to share with you today using Kitty Bee Designs Owl Witch digital stamp! I used some Prismacolor and Hobby Colour Markers, both alcohol based, to colour this sweetie up after printing her on white cardstock. I love adding gel pen details - white on the body and blue on the hat. I embossed the background with a Tim Holtz embossing folder that resembles shattered ice, but I felt like with the owl sitting in the middle, on top of the 'tree branch' sentiment - it kind of looked like a spooky tree in the background! I stamped the sentiment with a Tim Holtz crazy sentiment stamp and added clear round enamel dots and SpiegelMom Scrap star sequins. Inside, I stamped a Tim Holtz Halloween stamp with blue Distress Oxide Ink. Thanks so much for stopping by today! I hope you have an awesome week, and be sure to check out the Kitty Bee Designs Blog and Shop for so much more inspiration! Double Trouble Challenge - Cute Halloween Thing 1! Hello friends! I'm over on the Southern Ridge Trading Company blog today sharing this adorable mini album. I just love creating mini albums and wanted to use this one to share our fall family photos from last year. It was such a beautiful day and we got lots of lovely shots. I pulled out the older Pumpkin Spice collection from Simple Stories and started crafting! Thanks so much for stopping by! Be sure to head over to the Southern Ridge Trading Company blog to see a closeup of each page and a list of supplies. Have an awesome, crafty week! Gerda Steiner Designs - Happy Halloween Kids! Hello friends! I'm over on the Gerda Steiner Designs Blog today to share a cute Halloween card using the adorable Halloween Kids Digital Stamp Bundle. This digi bundle comes with all the images you see here! You can layer them together like I did or print them out separately - lots of options and of course with digis you can size them as you like and print as much as you want. I wanted to create a little scene with these cute kids and I had lots of fun colouring them with my Jane Davenport Magic Wand colouring pencils. Thanks so much for stopping by today! Be sure to head over to the Gerda Steiner Designs Blog to see closeups and get all the details on how I created this cute card. Wishing you an awesome week ahead! Lasting Memories Scrapbook Challenge - Halloween Fun! Hello! I'm back with my fourth layout as a Guest Designer for the awesome Lasting Memories Challenge Blog, and this week our theme is Halloween! I love celebrating Halloween - our house is decorated, but not scary! I've made lots of cards, crafts and scrapbook pages - so today I'm sharing a layout about last year's Halloween school dance. We all dressed up and had an awesome time. I recently picked up the Simple Stories Vintage Halloween paper pack, ephemera and chipboard stickers, and they were perfect to use for this page! The printed background paper was so fun and had great splatters and layers already on it. I cut some of the other papers in the pack to layer around my photo and on the edge of the page. The Scary Sweet sentiment from the Ephemera Pack was perfect to use as a title since I think we were a mix of that! I layered fun chipboard stickers and sequins from my stash to add even more texture. I had so much fun creating this layout! Almost as much as I had at the party, lol 😉 Be sure to head over to the Lasting Memories Challenge Blog to see what all the other Designers have come up with for this challenge - and enter your own Halloween Layout. 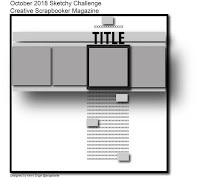 There are four weeks of challenges you can see on the sidebar and you have until October 27th to enter all or some of them. I can't wait to see what you come up with! Canvas Corp Brands Creative Crew Challenge - Think Pink! Hello! I sure hope you've had an awesome week 💗 Mine was great, but flew by so fast! Today I'm sharing a pretty gift bag for my daughter's teacher. Her birthday was today and Amie, who is 11, just adores her. She's had an amazing school year so far - isn't that awesome when that happens?!! Amie even went in early with some class mates to decorate the classroom and the teacher was so surprised and thought it was very sweet. This gift bag goes along with our Pink Theme for our Crew Challenge this month on the Canvas Corp Brands Creative Studio blog in support of Breast Cancer Awareness. I fussy cut a lovely tea pot from the printed Bags and Beans Canvas sheet and painted it with the Tattered Angels Mists. I then added some French knot embroidery stitches and glued it down with tacky glue. I used the Tattered Angels Mists on a piece of plastic packaging to add a ‘smooshed’ effect to the canvas bag as well as the Happy Birthday tag and then used the Mists again to colour the seam binding ribbon to match. I was able to stamp directly onto the white paper mini bag using Archival ink and a fabulous coffee stamp from Emerald Creek Craft Supplies, designed by Pam Bray. I then used the Tattered Angels Mists and paints to add colour to the image. The bag is the perfect size to slip a gift card into. I tucked the decorated mini bag into the tiny tote and added a happy birthday tag for a very special gift card presentation. A few sparkly SpiegelMom Scraps sequins and a pretty pink handmade flower from Little Birdie Crafts finish it off. Thanks so much for stopping by! Be sure to head over to the Creative Studio blog to see all the other amazing pink entries, and I hope you have a fabulous weekend! 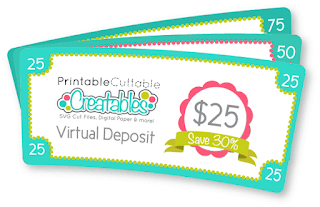 Happy Monday and welcome to another Fantabulous Cricut Monday challenge! Make a project using anything Halloween related. But there has to be a least one cut from the Cricut Library! To qualify for the prize, be sure to use at least 1 Cricut cut on your project and if it's not obvious, let us know what cartridge you used. If you use a Cricut Explore machine, at least one cut must be from the Cricut catalog of images. If it isn't a card, you will get two entries into the drawing! For this week's challenge I'm using some fun halloween files from the Printable Cuttable Creatables website - Halloween Witch Cauldron, Monster Mash & Tentacle Monster, along with the Mini Monster Cricut Cartridge to make a fun and not too spooky Halloween card! Inside, I added a sentiment from the Mini Monsters cartridge and added a bit of silver Wink Of Stella to the edges of the gray letters. I love the way this cut layers the words! Thanks so much for stopping by! Be sure to head over to the FCCB post to see what all the other designers have come up with for this spooky challenge, and have an awesome week friends! Lasting Memories - It's All About The Pink Layout! Hello! I'm so excited to be joining the Lasting Memories Scrapbook Challenge Blog as a Guest Designer for another challenge week! This month the theme is Fall Events, and since October is Breast Cancer Awareness Month, this week our challenge is to create a layout about breast cancer or create a monochromatic pink layout. I am so fortunate that I don't have someone who has suffered from breast cancer in my immediate family, so I decided to create a pink layout in support of Breast Cancer Awareness. These photos are from when my youngest daughter, Erica, now 6, was born and her two older sisters came to meet her! I combined two different pink papers, using the fronts and the backsides and then layered the base on a pink watercolour background. 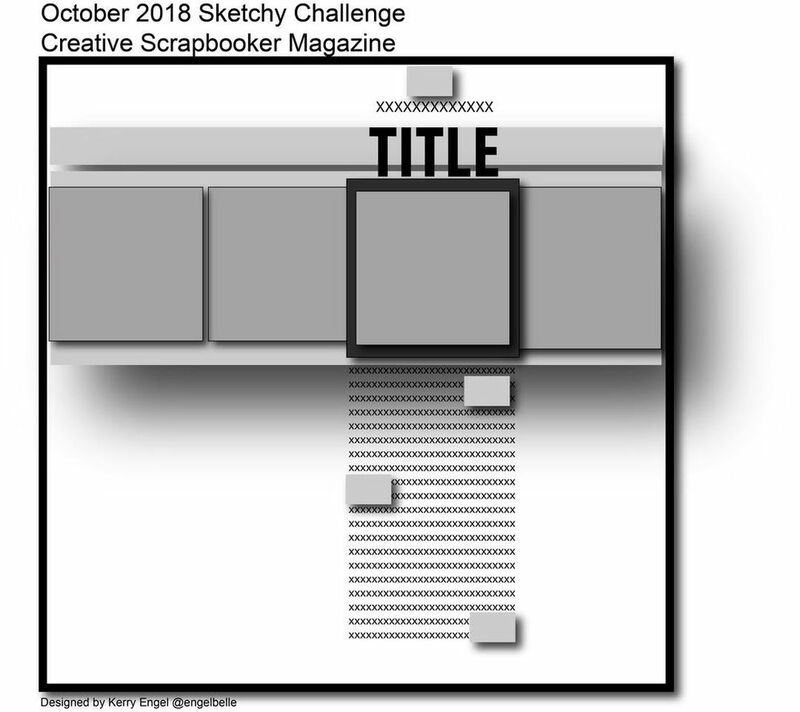 I decided to use the October Sketchy Challenge from Creative Scrapbooker Magazine and really love how easy it is to create with this sketch! I used some Tattered Angels Light Pink High Impact Paint to paint my cute wood veneer bird embellishment and then sponged pink Distress Ink around the edge. I even used the same pink ink to add a date stamp. I added a few more embellishments along with bottom of the photos and layered them over a journaling card from a cut apart sheet. You can see the Tattered Angels Tutti Frutti Glimmer Mist I smooshed onto the white cardstock background peeking out from behind the embellishments. Project Life Thanksgiving Layout & Winner! Hello friends! It's been a busy, but awesome weekend, so I thought I'd share a couple pics of our Thanksgiving dinner here in Canada using the Project Life App on my phone. The app is actually free now, which is amazing! I love using it for a photo collage and to get a quick digital layout done that I may want to share online. I think putting these into a printable photo book would be a great idea too! We had an awesome turkey dinner and even tried a couple new sides, which turned out great! And, of course, the best part was being with family and friends! Thanks so much everyone for your sweet comments! And Congrats Carla for leaving the winning comment 😃Please email me at karlajyungwirth at gmail dot com and I'll get that out to you asap! Emerald Creek Craft Supplies - Spooky Tag Tutorial! Good Morning, and Happy Thanksgiving to all my Canadian friends! I've had lots of projects to share on my blog over the past few days, so be sure to check them all out!! Today, I'm over on the Emerald Creek Craft Supplies Blog sharing this cool and spooky Happy Halloween tag with lots of techniques and fun details for our October Challenge, In The Night. Be sure to stop over at the Emerald Creek Craft Supplies Blog to see closeups and details, and enter your own 'In The Night' project for a chance to win! We'd love to see what you come up with 💓 Wishing you a wonderful, crafty week!! Southern Ridge Trading Company - Halloween Mini Banner & News! Well, I guess this is the week of exciting news for me 😉and today I'm sharing that I've just joined the Southern Ridge Trading Company Design Team! SRTC is a Canadian based business that carries a huge selection of wood veneer, chipboard and stencils - perfect for all your crafty needs! I have used the SRTC products in the past and love the quality and designs, so I can't wait to bring you fun projects using it! Today, I'm over on the SRTC Blog where I'm sharing this fun Halloween Mini Banner. Here's a look at my mantel, decorated for the fall and Halloween season (since Erica who is 6 was helping me decorate and decided we simply had to put up everything right now...) with this fun banner across a framed subway art print. Thanks so much for stopping by! Be sure to stop over to the Southern Ridge Trading Company Blog to see lots of inky closeups and get all the details! Gerda Steiner Designs - Happy Fall Printable & News! Hello friends! I am so excited to announce that I have joined the Gerda Steiner Digital Stamp Design Team! Gerda has the most adorable clear and digi stamps 😍 that I'm sure you've seen me use many times, and I'm really excited to keep on using these sweet images. For my first post on the Gerda Steiner Designs Blog I'm using the adorable Happy Fall Greeting Card Printable to create a cute Autumn Card. Be sure to head over to Gerda Steiner Designs Blog to see a closeup and get the details on how I created this card! Thank you so much for stopping by. I hope you have an awesome week! Lasting Memories - Blessed & So Grateful Thanksgiving Layout! Hello! I'm so excited to be joining the Lasting Memories Scrapbook Challenge Blog as a Guest Designer for another challenge week! This month the theme is Fall Celebrations, and this week our challenge is to create a layout about Thanksgiving or something that you are thankful for. Since today is the Sunday before Thanksgiving in Canada I thought I'd do a double page layout using photos from last year's celebration! I'm using paper from a Recollections fall paper pad, which has some lovely gold foil elements in it and a watercolor look. This coordinated nicely with the watercolor florals in the Pink and Cream Bouquet Ephemera from Cheeky Studios and the AC gold word thickers. I added a bit more sparkle with some SpiegelMom Scraps sequins (don't forget to use the code KARLA15 to save 15% at the SMS Shop!) I like using Ranger Multi Medium, which dries clear, to apply the sequins. I used sentiments from the Tim Holtz Chit Chat Occasions sticker booklet in both black and white around my pages. This pretty chipboard flower sticker and the ampersand from one of Paige Evan's collections also have gold foil on them and coordinate nicely. I based my layouts on a double page sketch from a Use Your Own Paper class from Scrapbookin' Adventures. We always do a table selfie at big dinners! I was able to size some of my photos at 3x4 and add the journaling in the Project Life app on my phone. It is free now and is such a wonderful way to create photo collages before you print. This way I was able to get extra pics on my pages! I also always edit my photos with Pic Tap Go, which is well worth the money, and can be used within the PL app! Thanks so much for stopping by today! Be sure to head over to the Lasting Memories Scrapbook Challenge Blog to see what all the other Design Team Members came up with for this challenge, and enter your own for a chance to win. You have all month to enter and four different challenges to participate in. I love that this gives you a jumpstart to scrapbooking Fall Celebrations! I'd love to see what you come up with 💘Have a wonderful week ahead, and Happy Thanksgiving to all my Canadian friends! Kitty Bee Designs #128 - Fairytale/Fantasy! 7gypsies - Summer Traveler's Journal! Wild Whisper - Farmer’s Market Layout!